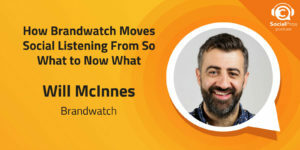 Will McInnes, Chief Marketing Officer at Brandwatch, joins the Social Pros Podcast to discuss the current state of social listening and how businesses should respond to data. The tools don’t matter if you don’t use them! Over the past ten years or so, reality tv shows about building, remodeling, or flipping homes have become wildly popular. They have even inspired countless people to go out and buy a toolbelt. Seeing a crack team of builders use their hammers, drills, and screwdrivers to create magnificent homes truly is inspiring, but what separates them from the average Joe and Jane whose tools have been resting in the garage? The only difference is what they choose to do with those tools. The same is true with businesses and customer data. Simply gathering and even understanding the data doesn’t grow your business, it’s what you choose to do with that data. Once you know what your customers want it’s time to pick up the proverbial hammer and get to work! Say yes! You have to be adventurous and learn from the scars you’re sure to gain along the way. Even being English, Will would love to speak with Barack Obama and hear him tell some stories. Jay Baer: Hey everybody, it's Jay Baer, founder of Convince and Convert. Welcome to this week's Social Pros podcast. My friend Adam Brown is off this week. 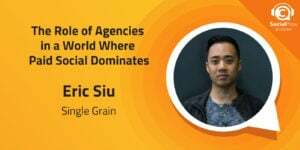 I'm going to be interviewing Will McInnes, who's the chief marketing officer of Brandwatch, one of the global leaders in social intelligence. This is an amazing company that really takes a lot of data and helps organizations, brands, agencies figure out what's being said and what to do about it, how to build their businesses, how to respond to social media chatter or social media crisis. Will's been doing this a long time, a super smart guy and really has a handle on the pulse of social data and where all that is headed. Some really interesting tidbits in today's episode as well about the future about social listening, about the future of data, where you can listen to what customers are saying in ways that you may not have thought of before. You're really gonna enjoy this one. Please stay tuned for this week's episode with Will McInnes, the chief marketing officer of Brandwatch. 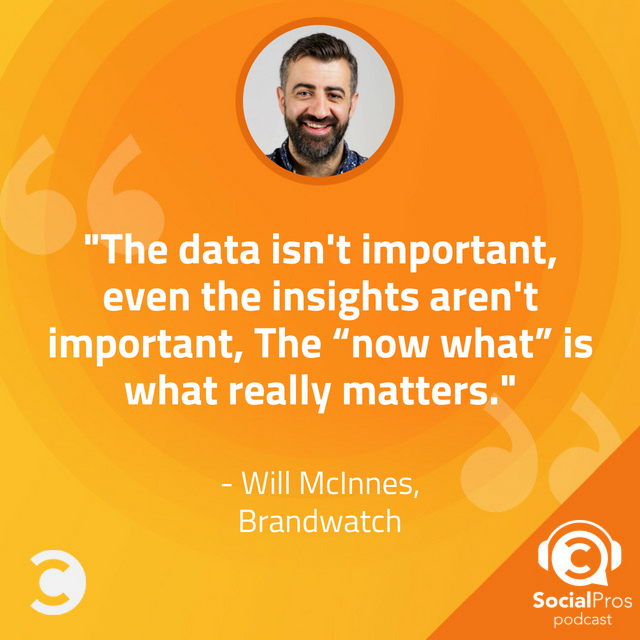 This week on Social Pros our guest is Will McInnes, chief marketing officer of Brandwatch. Adam's off today, but delighted to be here with Will. My friend, thank you so much for being on the podcast. How are you? Will McInnes: I'm really good, Jay. It's great to be here with you. Thank you. Jay Baer: My pleasure. Before we get into it too deep, thank you very much for being a sponsor of this show as well. Really appreciate Brandwatch coming aboard as a sponsor here of Social Pros over the last few weeks, been fantastic to work with you and the entire team. Now because I've been talking about Brandwatch here for a bit on the show, I suspect that most listeners are familiar with what you do, but just in case this might be your first show or the second show that you've tuned in to Social Pros, maybe Will it would be great for you to describe sort of the core offering for Brandwatch. Will McInnes: Sure. Thanks Jay. So Brandwatch is the global leader in social intelligence. And what that means is we've got this intelligence suite of products that help you as a marketer or a social media professional find the answers that you need from social really quickly. So whether you're a marketing analyst in Unilever and you want to understand where haircare trends emerge and what the key topics are or whether you're working in an independent agency in Ohio and you just want some great material for the pitch tomorrow to really wow the client, you can use Brandwatch tools to find out the answers that you want about what people are talking about, who's influential, those kinds of things. Jay Baer: One of the things that's interesting about Brandwatch is that you're not by any stretch of the imagination a startup. The company was actually founded in 2005. Will McInnes: That's right, yeah. We are now 400 employees, I think it's eight offices now, Singapore being our most recent adventure. And you know what? That's just absolutely fantastic because it brings in so much color and diversity and interesting global opportunities. So you're right, we've been around. Just like we were saying, this podcast has got a fantastic backstory and history. So does Brandwatch. We're not new kids on the block. Jay Baer: You talked about the role of social data and analysis within insights. I think it's important to make sure that listeners understand that there really are two sides of that coin. Now, and many people who are listening to this show live this every day, but just to sort of set the stage, you sort of have these social publishing platforms and software companies, and then you have the listening and analysis and sort of intelligence platforms of which Brandwatch is a leader. Will McInnes: Yeah that's right. I think from my point of view, I'm a CMO. I'm a marketer like so many of your listeners. I too work in this broad domain of communications and marketing. I really like that old adage from the tailoring world, which is measure twice, cut once. The emphasis is on making the right decision before you move. We've chosen at Brandwatch to go really deep on the intelligence piece. We partner with great people like Hootsuite and Spredfast and others on the engagement and publishing and all of those other important parts of the social media marketing workflow. But what we're really good at and what we're best bred in is that deep listening, deep intelligence and quick insights, too. 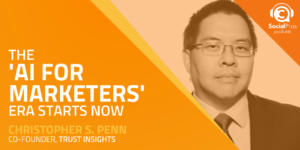 Jay Baer: Because you have so much depth on the insights generation side, is it true that some of your customers are what we would consider to be social media marketers, but some are sort of insights professionals? BDI folks or I think you've called it in other things that you've written, social consumer market intelligence or social CMI. Can you talk about your vision for that role and how it differs from the marketing role? Will McInnes: Yeah, that's a great point, Jay. So what we're experiencing, and you can see this really in all sorts of types of organizations is there are people who are out and out analysts, whose personalities, track record, interests are about really wrangling the data. They love flexibility, they love the ability to drill into things. They don't want too much black box. What they want is to get their hands on the data. And those people are real connoisseurs of Brandwatch, and they're on the kind of deeper analysts side, if you like. And then there's the people- I wouldn't be one of those- then there's the people a bit more like me who are everyday marketers. They are people who want to get in and out of the platform as quickly as possible. They need to do monthly reports and they need to impress their client or give an answer to their boss about where a crisis emerging from or what people care about most on a given topic. So there is this interesting split, where you've kind of got broad and shallow on the everyday marketers. Lots of us exist, but we don't want to get too deep into platform. And then there are these connoisseurs who really, really care about the integrity of the data, that the robustness of the sample size, the defensibility of the insight that they're gonna put forward. And sometimes they're putting forward these proposals that board level or C-Suite level of Fortune 500 organizations. Those are a very different type of person to the every day marketer. Jay Baer: When you have new clients, do you onboard those people differently? I mean, you sort of explain the value proposition of Brandwatch differently if somebody is sort of an operations minded social media marketer versus somebody who really is more of that data centric thinker? Will McInnes: We do, but I think we could keep doing a better job on that. I think as we learn and as this market is maturing, we're finding that the two groups recognize one another, and in particular the champions and the deep analysts who use Brandwatch products, some of them are in the platform all day every day. They want a product experience that their internal clients who are these every day marketers can enjoy and benefit from and be easily onboarded to. So yes, we are, but I think what's happening is as social intelligence becomes part of the mainstream, as it doesn't become so hypey and exciting in a sort of sizzly and new way anymore, what's happening is expectations are going up and it's more like, well, I need to be able to share this with 300 colleagues around the world. What's their experience gonna be like? So we're moving with that. We're moving with our clients. That's a really big part of our product roadmap this year. Jay Baer: I've said this before. It's not really about big data, it's about big understanding, right? Data in and of itself has no net present value. It's just a bunch of numbers on a page. That's one of the things that I like about Brandwatch is your Vizia area, that product, which is a data visualization tool that really allows you to merchandise findings better inside the organization. Because ultimately, people who don't do this for a living, people who are not "social pros," are gonna have to make decisions and take actions based on this data and I really like the way you make it easier for people to say look, here's what this actually means. Because unless you know what it means, then why are we doing this at all, really? Jay Baer: I like that. Will McInnes: Was the now what ... Yeah. And the now what is what really matters. It's the compelling next step that someone's actually going to take and our guys in the Vizia team are saying, you know, how many insights actually get consumed? How many PDFs actually get opened? How many PowerPoints are acted on? If we can work on that problem for our clients and help them get more engagement for the hard work that they do, then maybe that will help their organization get competitive advantage. Jay Baer: Historically, Brandwatch and similar platforms have focused a lot on what's being said about your brand, your company. What are your customers talking about? What do they like, what don't they like, what's the sentiment about the brand, etc. You're ruling out a new feature soon. In fact, I'm doing a webinar with your team on June 7th about this. Go to SocialPros.com and look for Will's episode for a direct link to sign up for the webinar. It's all about this new featured set you're rolling out about competitive analysis, where you can actually use Brandwatch data to say alright, here's how we're doing it and that's great. We've gone from the what to the so what to the now what, but how are our competitors doing? What are they doing that is getting traction? What are they doing that's not getting traction? And then being able to take that data and build it back into your own programs. Talk about why you added that feature and how you see it fitting into the role of the social media professional. Will McInnes: Yeah. As you say, the history of social analytics outside of Brandwatch, but all of the peers and competitors that play in that same space, has been highly configurable and essentially allowed you to start with key words. So it's like what are the topics I'm interested in? Then as this space has matured, as we the marketing community, the digital marketing community have gotten more sophisticated, we started to zoom in on sub-domains like influence in marketing and competitor trackings as you say, Jay. For us, our job is to get people to the answers they want as quickly as possible. We're hearing more and more from clients that being able to do that kind of competitive benchmarking is really important. Too often with Brandwatch you would have to set up not only your brand, but the competitor's. And what we want to do is get you to the benchmark quicker. Fair enough, lots of people talked about us last month or maybe not many talked about us, but how did, importantly, what's the context? What's the competitive element? Are we doing better or worse than the competition? Are we doing better or worse than we were doing in the previous period? We want to be serving up those answers on a plate for our users and for our customers, rather than them doing the work. For us at Brandwatch, this is the year of intelligence. We work in the field of social intelligence. But for us, intelligence is giving you no-nonsense answers and letting the platforms do the heavy lifting rather than all of the configuration having to come from you. Jay Baer: Do you think it's better for people to derive value from an advanced social listening tool when they start with questions or should they start with the data and try to find patterns in the data? Will McInnes: That is an awesome question, Jay, and it came up in our customer advisory board recently. I ended up making a note for my team, which was maybe we can publish a paper on asking better questions of your social intelligence feed. Because as your question leads us, you talk to smart analysts and they're frustrated by the "can you just." Can you just quickly check this out for me, can you just have a quick look at that. Give them a tough business question. Give them something pertinent and strategic and valuable, whether you're an independent agency or whether you're a mega corp. I think if we the client, whether we're internal or external, ask a better question, we set a more exciting, engagement brief for the analysts. That's when you know this question of are or why from social just completely disappears, cause the best examples I've heard of of are or why from social intelligence are where the means have been used to answer real, profound customer experience or business or products or service questions. Nothing to do with inverted commerce marketing. Jay Baer: Boy, that is an incredibly true point. Every time I've worked with social intelligence on the client side, on the consulting side, the big weigh ins were always after the CX level. It's not make a better campaign, it's not make a better Instagram photo, it's always change the way we operate our business because we've discovered something that our customers really, really like or something that our customers really don't like and we've listened, we've heard them, and we've made changes on the fly and improved the fundamental offering of the organization. That's where the real opportunity is. I think we lose sight of that sometimes cause we think about well, let's use data to make social media better. Let's use data to make marketing better. That's not unimportant. But those are not big moves on the chess board. Will McInnes: We agree completely. The most exciting examples I come across are where as you say the CX changes, the product changes, the service changes. That's when I go back to my roots and I get a really warm, fuzzy feeling because I don't do what I do just to make marketing campaigns better. That is important and that's my day job. But what I really believe in is the internet and social's ability to improve our organizations, and as a result, improve society. I think if we've got organizations that are really listening and really adapting at a quicker pace and with a bit more agility and subtlety, then I think we're in good shape. We all remember the old days, or the older listeners certainly will, of that sense of dealing with a faceless organization and the frustration of not being able to get through to the right person. But Brandwatch clients are definitely changing what they're doing in response to real customer feedback. That is meaningful. Jay Baer: Well, and to get the perspective of people who work in that data and make those kind of changes and discover those kind of insights, next week on the show, next week's Social Pros guest is Chuck Hemann, who is the head of analytics for the WTO group and is also the co-author of the new second edition of Digital Marking Analytics. Chuck is one of the best and the most respected digital analysts in the world. He'll be on the show next week, so listeners tune in for that. It's gonna be a great companion. 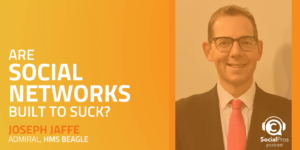 We didn't set it up this way, it just worked out happy accident as Will this week and Chuck next week talking about digital analytics and social analytics in practice day to day for his corporate clients. It's gonna be a lot of fun and his new book is amazing, by the way. So, Will, let me ask you this. Jay Baer: Yeah, it's gonna be great. This is one of the things that I really want to get your take on. A lot of the data that you ingest into Brandwatch, and this is not a Brandwatch question, it's a sort of the nature of social listening today, not all of it, certainly. That's not a fair characterization. But a lot of the data is Twitter centric. Jay Baer: Twitter's growth is not runaway, certainly. And Twitter is now, at least in the U.S. in terms of monthly active users, like the fifth or sixth most popular social network. So do we run a risk of saying, alright, a lot of our insights, and again, not all of them, but many of them are derived from Twitter but yet Twitter is not a reflection of everybody. So are we making decisions based on less than the whole story? Will McInnes: Here's how we think about it at Brandwatch. We are delighted to be one of a very small number of official Twitter partners, and that gives us all sorts of privileges and access to the Twitter team and their most innovative offerings and so on. And that is really important. What is also really important is a globally diverse, appropriately representative set of data sources. So for the team at Brandwatch and as a dedicated team to this as you'd expect, because this is our supply chain, if you like. Our job is never ending. This team's job is never ending. It needs to be as far reaching and as representative and as deep and wide as we can be. But as you kind of hint at, some of the big social networks do not have a kind of default open policy to providing social data, whether that's appropriately anonymized and aggregated, which we would very much be happy with. And in particular, given some of the big news items over the last couple of months, those guys are suffering and if anything re-trenching. So I think there's a really interesting tension for not just me and our company, but for us as marketers, which is we would love data. We would love access to the fullness of public social conversations. But there's a really important flip side to that, which is we as members of society are participating in forums and in social networks where we may not want that data to be accessible or we may not realize that it is. And that is playing out, and we are really open minded about that at Brandwatch and we're very transparent about what we do. I think it's just going to be really interesting to see how that pans out. But from our point of view, the bottom line is there's a hell of a lot of content on the rest of the web that is social, that is default open, that is appropriate and doesn't invade any kind of personal privacy. Our clients want insight from niche car forums, from parenting forums, from new social networks and platforms in regions where their business is expanding elsewhere in the world. There's plenty for us to do on that front. We're not feeling terribly afraid. Jay Baer: I'm glad you mentioned forums. We'll talk about that next week with Chuck as well. I talked about it as well in my book, Hug Your Haters, that forums are still the most untapped source of customer interaction and customer data on the internet. Your very best customers are the ones who are posting about you or about the topic in forums. I mean, nobody goes to a forum on accident, right? They go because it's their tribe and we have to use that as an early warning indicator and spend more time not only listening, but I think also participating in those places. I think you're exactly right. I know you don't know the answer to this Will, but I want to ask you just because you know as much as anybody in the world: do you think, what is your prediction? Do you think that Facebook will ever open data to a tool like Brandwatch, well, and all tools, and have more open data so that you can index it and do the kind of analysis that you want to do, or do you think that ship has sailed? Jay Baer: They should have done it before. Jay Baer: Now it's not a great narrative, even if they did it today, now it's not a great narrative. Jay Baer: Before they could have done it and it would have been fine. Will McInnes: Exactly. Exactly. And I think they have an awesomely successful business built around advertising and the kind of net, the marginal gain of doing something in that space versus the fear and muscle memory of what's gone on recently. I'm just not seeing that happening in the foreseeable future. Jay Baer: Let me ask you a somewhat related question. I don't know how you'll answer to this. I don't know whether this is a net positive or something else for companies like Brandwatch. We have more and more content being created in different formats. We've got more photos, we've got more videos, we've got more live video. We have more stories, GIFs, emojis. Does this panoply now of communication, most of it in some sort of photo or illustration, does that give you a richer tableau of things to analyze or does it make it trickier to sort of do pattern recognition? Or maybe both? Will McInnes: Yes. You stole my punch line, Jay. It's yes. It's both. Wow. From a client point of view and from a user point of view, this is richer. Brandwatch has added to its analytics platform emojis in the last 12 months. We've added image analysis. The image analysis stuff is incredibly successful with our clients because it is, as you say, it's a whole new rich-textured environment for them to understand the pickup of their brand, the ROI of their sponsorship because they're seeing the stadium or the logo on a cup in places where their words would never have been mentioned. So yes, and it's a fiercer technical challenge because my expectation as an outsider to the Brandwatch empire would be, well, surely you can do this. Surely you can just add this new stuff. I want video, I want more pictures. Jay Baer: Yeah, you just turn that on, right? Just turn that on for me. Will McInnes: Yeah. There's a great point elsewhere about customer experience is now set by the best customer experience we have that day, whether its Uber or Amazon or Starbucks or whoever they're, Apple is the exemplaries. My expectation is now from everything are that my experience will be that good. That's the bench mark. And by the same token, we now think that, well, this business B2B software that I use at work should be as easy to use as those apps. It should be as all-encompassing as those apps. It should be as instant and lighting fast as those apps. And that's a brilliant challenge for those of us working in software, because the benchmark just goes up and up. Jay Baer: A number of brands use Brandwatch, per the name, to watch sentiment and conversation around their brand. Certainly it's a great tool for early warning, canary in the coal mine type, hey, maybe there's a crisis brewing. In fact, you guys have published some great content about social media crisis management and crisis response. Do you feel like there is an increase in brand outrage? I've seen some content to that effect, not necessarily from you, but in other places that consumers are quicker now to be "offended" by brands and then there's this sort of general piling on, primarily in social media. Do you think that's a true circumstance, that there is more brand outrage, or are we just more aware of it now? Will McInnes: I think as a Brandwatcher I should answer by saying I'd love to quantify it, because that's what we do and I'd love to ask some really smart people in our company to look at that and find out. My gut is, without that data, is absolutely. I feel like we are living in an era where we know, actually, a lot of time we've become savvier as consumers and we know that our voice has a bit more power than it used to. So whether it's a Glass Door review, an Airbnb review, an Amazon review, a Yelp review, or as you say, just a kind of joining large scale campaigns or hating in social media, I think we've learned that we might get more of what we want if we we do that. I think that as that feedback loop cycles through, brands are learning the hard way that consumers have that voice. The C-Suite pay attention to it. It's a highly visible broken window. Things get done internally when very small external social media crises kick off, way smaller than the ones we're used to hearing about and seeing about. Things get done. People move fast because members of the organization with clout are paying attention to what's being said outside and it's embarrassing. So I do think you're right. I do think we are seeing more of that. But I'd love to quantify it. Jay Baer: Going on in there and some offense that is being taken perhaps disproportionate to the actual circumstance. I think it's great that brands are actually listening more than they used to and it's fantastic that they're actually making changes based on "the voice of the customer," I just want to make sure that customers are holding up their end of the bargain as well. Will McInnes: It's a great point, Jay. You know, when I was first doing this kind of work and training groups of marketers on social media back in the day, I remember asking them regularly as part of my one day approach, what do you do when you look at reviews? And what I was really relieved to hear them say is I look at the extremes and then I look up are they talking about things I care about? So if this person is complaining about the size of the bathroom, but this person is saying it's really good because it's close to the Leaning Tower of Pisa, then they're making intelligent decisions about which opinion to respect and to attend to. So I think there is this polarization happening and I think that what's good is that people are assessing it intelligently. But what my concern is is that online debate doesn't feel very safe and there are polls. It is quite polarized. I was in recently an interesting discussion with friends on Facebook about something that really riled up a bunch of people within our social network and what I noticed that three people I know quite well left an answer that said I won't be returning to this thread and I thought that was a really interesting behavior that I haven't seen before. And it felt odd, cause it kind of felt like I'm listening and I'm talking back, but I won't come back again, and at the same time was feeling empathy for them cause I was guessing it was because of bad experiences previously. There was also a sadness about it, which is like we got to this point now where people don't feel able to stay in a conversation and I think that's a really intriguing next step. Jay Baer: And the data shows that that is in particularly true in Facebook. I read a post about this just a couple weeks ago how Instagram is actually growing and Facebook is actually shrinking marginally in the U.S. partially because Instagram is a more "positive" scenario and you just don't have the same kind of angst and back and forth conversations and arguments and people are growing a little weary of that on Facebook. So it's an interesting time for sure. What's your favorite social platform personally? Is it Facebook? What do you use the most? Will McInnes: I would have to say, selfishly, Instagram. I absolutely love Instagram. I have loved it from the day I joined. I love the visual nature of it. I love the interactions. Business-wise, I've got, you know, for me, I've got a constant habit to be on Twitter, to be tweeting, to be checking. It's where I get all of my news. But I've kind of started looking at LinkedIn more and more. Will McInnes: So I think the new feed on LinkedIn has been ... I mean, there's some silliness there, but actually I've found that they've got more of my attention than they used to have. Jay Baer: I agree. They're doing a much better job and it's a good segue as well. Three weeks from now our guest on the show will be Melonie Dodaro and Melonie wrote the best-selling book on LinkedIn for business and LinkedIn for marketing so make sure you tune in for that episode. Melonie Dodaro in three weeks, all about LinkedIn. I agree about Instagram. In fact, I predict, this may be crazy, but this is my prediction in my recent article, that by 2020 Instagram will surpass Facebook in daily active users in the United States. We'll see if that happens, but I think they've got all of the ingredients and none of the drawbacks that Facebook has hung around their own neck in a lot of ways. We'll see. Will McInnes: I love that prediction, Jay. I'm loving the prediction. I would plus one it. Jay Baer: Good! That's nice to hear. You wrote a book called "Culture Shock: A Handbook for 21st Century Business." You wrote it in 2012. Congratulations on getting Culture Shock put together. I suspect in that book, I haven't had a chance to read it but I'll pick it up, I suspect you made some predictions and some premises. How right or wrong were you? What are the ... I know as somebody who as written a bunch of books as well, and you write books about marketing and digital marketing, you always sometimes feel like yeah, I nailed that one and other ones like boy, I wish I would have had that prediction back. Jay Baer: Anything in Culture Shock you're like boy, I either nailed it or maybe I was wrong? Will McInnes: It's a really nice opportunity to reflect. I think I nailed the themes, but I chose examples that now I would look at to illustrate those themes and I would, being slightly older and slightly more skeptical and having been amassed in a very data driven environment for the last nearly five years at Brandwatch, I didn't pick the best examples always. I think they haven't stood the test of time as well as the themes. The themes I believe in as much today as I did when I wrote it and I think a lot of what we've talked about today, Jay, is in there. One for me would be around just the fact that the web has made the world a more transparent and open place, whether we like it or not. Whether it's salary data, Glass Door reviews, Yelp as we touched on a few minutes ago. I think that the book is really about what does the internet do to organizations. So at that level I'm happy with that. Jay Baer: You ever think about writing the second edition? Will McInnes: I'd love write another book. I don't know what I'd write it about, to be honest. I've got a lot of respect for you and the books that you've published and I love seeing people whose output is continued. That was a body of work that I'd spent time developing through talks and training materials and writing and then the book was kind of fairly easy as a result. Will McInnes: I'd love to write another book. I'm not sure about you Jay, but I love the process. But I'm not ready yet. There isn't something I need to get out right now. Jay Baer: I totally understand where you're coming from. Absolutely. Now Will, you were also a rugby player at the University of Liverpool. Do you sometimes feel that the social technology business is very similar to a game of rugby, and I'm sure that that path of your life has come in handy sometimes? Will McInnes: Oh, I love it. I do, now that you mention it. I think you ... Yeah. There's a lot of rough and tumble, you know? It's, yes. It's a tough game and it's very physical and exhausting, but you're there with your brothers, your comrades around you. The sense of team is absolutely vital. No one person can win a game, you know? I do. Yes. Jay Baer: Good. Will, I'm gonna ask you the two questions that we've asked all 317 guests on this show who have preceded you on Social Pros. The first question is, what one tip would you give somebody who is looking to become a social pro? Will McInnes: I would say say yes. The best moments of my life have been when an open door has been presented to me and I've not really known what's on the other side of it, but I've gone for it anyway. I think that this is a broad thing, but when I meet the people I consider to be social pros out there in the world at events, they're adventurous and they have been through stuff and to your point about is it a bit like a game of rugby, you've gotta have a few scars and you've gotta have had some formative experiences and failed plenty of times. So I'm not sure if that's a little bit too life coaching, but that's my answer. Jay Baer: Oh, I love it. I think it's terrific and very, very true for this industry. Well said. Last question for Will McInnes who is the Chief Marketing Officer of Brandwatch: if you could do a Zoom video call with any living person, who would it be, Will? Will McInnes: I would love to talk to Barack Obama. I would just love to even to just say hello would be fantastic and to hear some of the stories. He's the guy that comes to mind. Sheryl Sandberg popped into my head as well. She's a business leader I really admire. But it would have to be President Obama. Jay Baer: We've had two or three answers of President Obama in the past, but I think you're the first Englishman to name check our President so as a former colony we appreciate your willingness to acknowledge our leaders. That's very kind of you, Will. Very magnanimous. I will be out there in November for the Youpreneur Summit. Fantastic event run by Chris Ducker. All for individuals who are really looking to build their personal brand and take it to the next level. I'm gonna key note that event. Want to make sure that we get a chance to have a pint when I'm out there. Will McInnes: Absolutely. I look forward to it, Jay. Thank you so much for having me. Jay Baer: My pleasure. We'll make it happen. That's Will McInnes, who's the CMO of Brandwatch, fantastic social intelligence company. Also a terrific sponsor of this podcast. Thank you Will and team for making that happen. 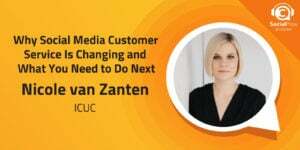 As I mentioned, I'm doing a webinar with Will's group in early June, all about competitive social listening and how to use competitor data so tune in for that. Go to SocialPros.com to find the link and to RSVP for the webinar. Speaking of SocialPros.com, every single transcript, every single audio recording, every single sponsorship, free E-book, et cetera is there, 318 episodes dating back eight years. Check it out. You can get lost for the weekend at SocialPros.com my friends. Next week, Mr. Adam Brown will be back with me. It's been three weeks since Adam and I were on the microphone together. Unbelievable. 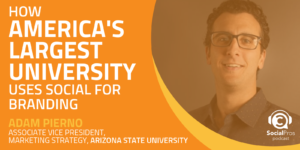 We're going to be back together next week talking to Chuck Hemann, who is the head of analytics for the WTO group and the co-author of the second edition of the book "Digital Marketing Analytics." Just comes out now. Terrific, terrific book if you're into the social media math, and you probably are if you're listening to this episode with Will, you're gonna want to hear our show next week with Chuck and grab his book as well. Until then, I am Jay Baer, founder of Convince and Convert. On behalf of Adam Brown of Salesforce Marketing Cloud and this week's special guest Will McInnes from Brandwatch, thanks so much for listening and we'll catch you next week.